Recently I came back from a trip to Antarctica to see the emperor penguins before they too become threatened by climate change and melting sea ice. Though the penguins were of course incredible, and their population on the island is stable, I was completely transfixed by the ice–especially when it go down to -20C and it started doing all kinds of unusual things. Each section was like an incredible abstract painting, with frost flowers that looked like stars and swirls that reminded me of the Milky Way. The ice spoke to my soul too. There were layers and rifts and cracks and uninterrupted blank white spaces. I couldn’t help but think of my own psyche while looking out over the landscape. I’d come to bury old stories here, at the frozen end of the earth, but being in the presence of this constantly changing ices-scape, Ifelt my heart thawing and life flowing through me again. There were colors too. Secret hidden colors under the sea ice that were revealed when ice chunks were upturned, and magical hues on the surface when the light refracted in a certain way under specific atmospheric conditions. 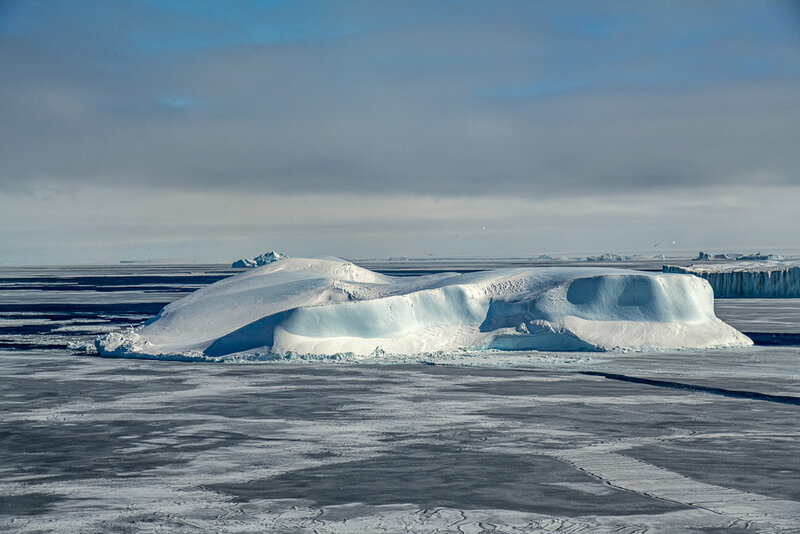 The Weddell Sea and Snow Hill Island were unlike anywhere I have ever been before. It was another universe. Below are some more images of this amazing environment, and I will post more in a gallery I’ll be uploading soon on this website. 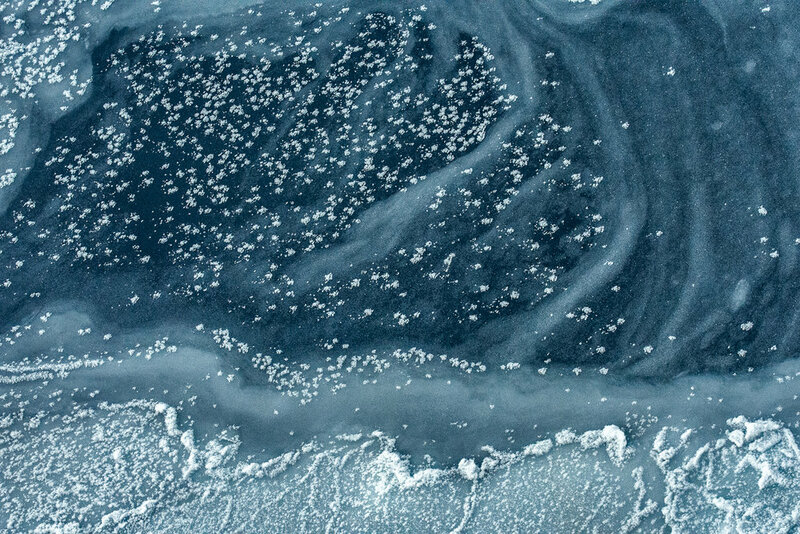 Before I discuss how the Antarctic ice is at risk and what this means for our planet, I’d first like to give you the opportunity to see just how beautiful sea ice is because it is disappearing faster here now and at an alarming rate in the Arctic. Though the icebreaker of course cracks the ice to get through, there are also many cracks that are naturally occurring, caused by ocean currents or the wind. When large areas of ice collide, it can cause rifts within the ice sheets. Watching this landscape was like watching geological process that usually take eons to occur right before my eyes. The image above shows a combination of many types of ice and icebergs, while the image below is a close up of thinning seasonal sea ice. 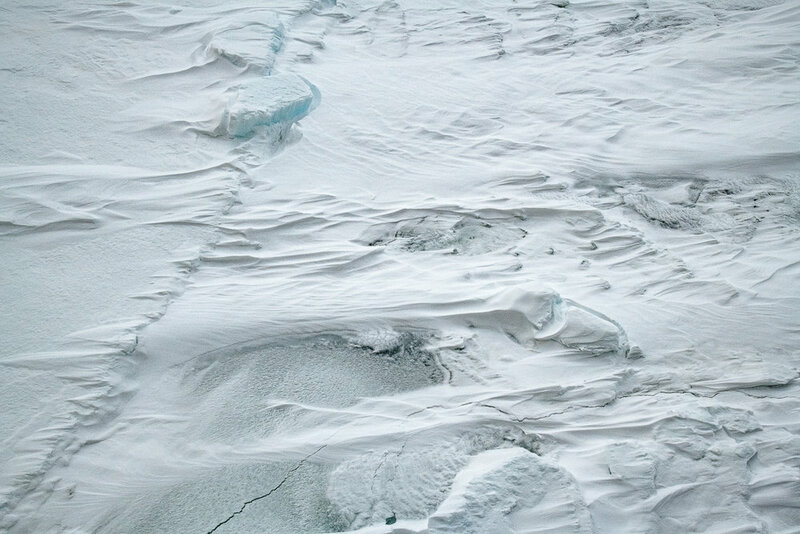 Though the patterns are extraordinary, the diminishing ice is of grave concern and indicates warming from below. The images below show a fascinating phenomena referred to as ice fingers. Thin layers of ice are blown and pushed over each other and resemble fingers. The geologist on board said that they extreme cold we experienced when we were there (-20C) contributed to some unusual effects that he had never witnessed before. I could have spent the rest of my life looking at sea ice. I really did not want to leave the Antarctic and before I went, I never would have thought I wanted to go there. It was the complete antithesis of the barren wilderness I expected. Yet, everything was so subtle too. When I returned and had to pass through airports in South America, I immediately suffered from profound culture shock from the cacophony of artificial lights, colors, and sounds. 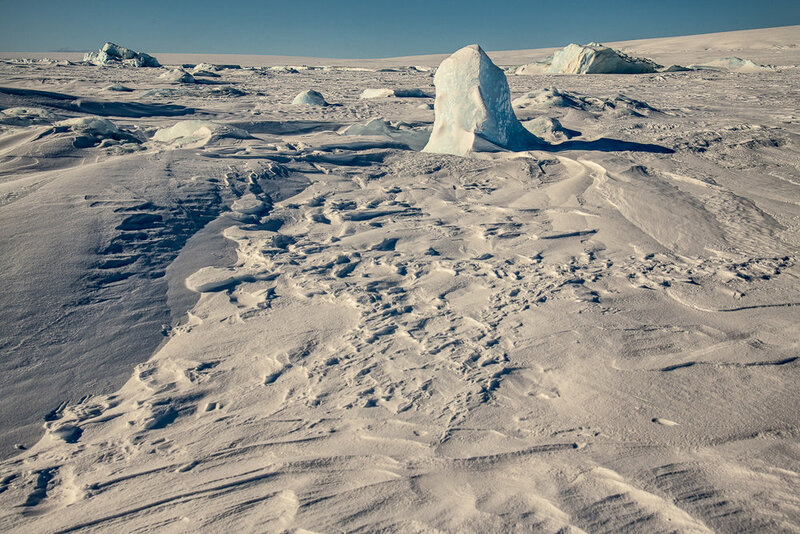 On Snow Hills Island, the ice resembled patterns in the sand of a desert or even the landscape of another planet like the Moon or Mars. It is so cold that it is in actuality a desert, with no water vapor entering the atmosphere and so the ice can become thin and blow like sand. There were many icebergs in the Weddell Sea as well, as the following images show. Sometimes the icebergs get attached to pack ice and freeze together and other times they float in the ocean currents, gradually melting from the warming ocean water. Sometimes, paradoxically, they melt so much they make the water and temperature a bit cooler and the sea ice grows, but then it melts from below as well. The wedge iceberg above had many rounded planes that appeared quite organic and like a Henry Moore Sculpture. It too was within the sea ice. As these freshwater icebergs melt, they alter the chemistry of the ocean by changing the saltwater/freshwater mix, which has far-reaching ramifications on ecosystems and whether or not species will become extinct. What will become of the Antarctic is still unknown. If we keep pouring carbon and methane gases into the atmosphere, glaciers, the ice shelf and sea ice will likely melt at an accelerated rate. 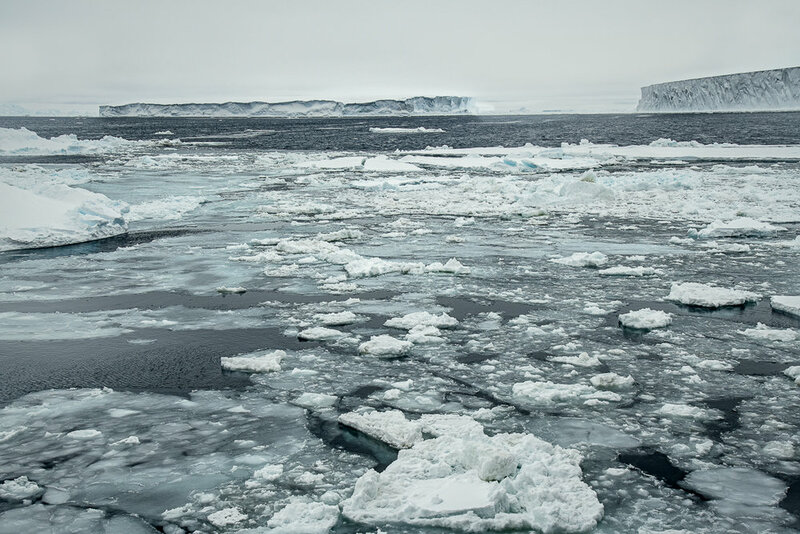 The Weddell Sea, because of ocean currents and where it is geographically located gets the most ice, but other areas in the Antarctic are experiencing ice melt at a more rapid pace. This year a study by 84 scientists from 44 international organizations indicated the ice is melting faster than ever and at the IPCC’s (Intergovernmental Panel on Climate Change) highest projection. 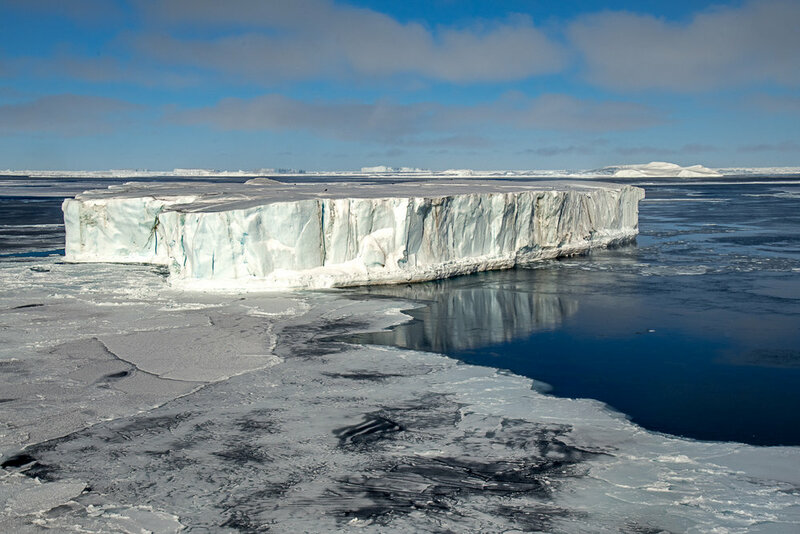 Since 1992, Antartica has lost nearly 3 trillion tons of ice. Forty percent of that loss was between 2012 and 2017, when ice loss went from 76 billion tons a year to 219 billion tons annually. This rings alarm bells for me. The Antarctic with ice is an important carbon and heat sink for the planet. If it looses even a substantial portion of its sea ice (which is enough to fill Denmark) sea level rise will be catastrophic. The more sea ice that disappears, the warmer the oceans of the world will become, since the ice won’t be there to block the suns rays. We are already experiencing increasingly severe storms. What happens to the Antarctic does not just affect coastal cities, though admittedly they will be harmed the most, it will affect the entire planet. The disappearance of Antarctic (and of course Arctic) sea ice is a global problem and not just because species such as emperor penguins, polar bears, and walruses will be threatened. It will impact all life.